The majority raved about the comfortable feel of the 1025 Tofane NW GT RR. It fits like a glove, according to numerous wearers. Umpteen hikers mentioned that despite its ultra-high price, this backpacking boot was all worth the money spent. The excellent craftsmanship of the Zamberlan 1025 Tofane NW GT RR received praises from loads of users. A great deal of owners recommended it for use in winter. Surprisingly, breaking it in was not necessary at all, based on plenty of customer reviews. Some backpackers lauded the effective waterproofing of the boot. A couple of hikers stated that they felt pain in the heel area after covering a few miles. A user disliked that scratches were easily noticeable on the Tofane NW GT RR from Zamberlan. Zamberlan did not fail to please in terms of comfort, fit and waterproofing with the 1025 Tofane NW GT RR. These features were admired and positively received by outdoorsmen, making them appreciate the price they paid for it. However, it was not able to convince everyone. As a whole, despite its unsatisfactory points, the Zamberlan 1025 Tofane NW GT RR is still a pair of backpacking boots that has a lot to offer on every adventure. Quality is defined in different ways, of course, and this pair checks off all definitions. The 1025 Tofane NW GT RR is a footgear ready for backpacking, hunting and accomplishing outdoor tasks. It is part of the Norwegian Welted boots line of Zamberlan which uses a construction method that includes two lines of stitching. This technique creates a sturdy yet comfortable build. Also, it allows the gear to be resoled (sole replacement). It employs a sole unit which takes care of cushioning and traction. Its midsole is a bi-density PU wedge, and its outsole is a rubber component called Zamberlan Vibram NorTrack. Zamberlan’s designers incorporated technologies in its leather upper to amplify protection. It is treated with Hydrobloc to heighten its durability. A Gore-Tex laminate promotes breathability and waterproofing. The Zamberlan 1025 Tofane NW GT RR caters to male backpackers. It is offered in standard width and regular sizes. Also, it fairly runs true to size. The brand shaped the boot using the ZBPK last. It has a backpacking profile which includes a low volume at the instep and wrapped foot flex point and toe area. The heel zone is tapered to create a snug rearfoot fit. The heel tip is sculptured to increase grip. 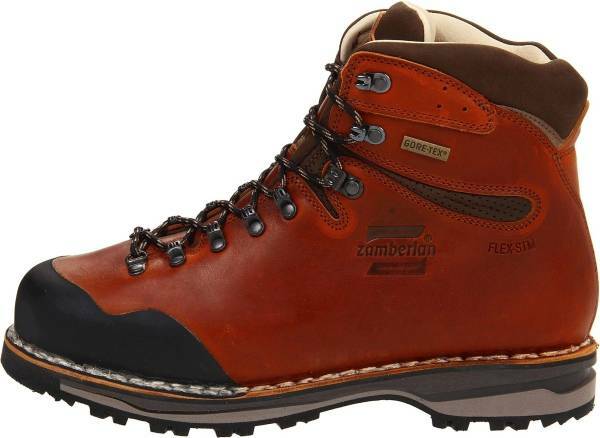 This boot for backpacking employs the Zamberlan Vibram NorTrack outsole. The multidirectional lugs at the center render 360-degree traction. The aggressive, widely-spaced cleats along the side of the sole create a self-cleaning system. The toe area has a beveled design for a smooth toe-off while the heel tip is sculptured to increase grip. The Zamberlan 1025 Tofane NW GT RR features a bi-density PU wedge underfoot to absorb shock from ground impacts and provide cushioning to users. The groove, which is visible at the exterior of the midsole, promotes flexibility. Additionally, a 3.5 mm Nor-Flex Light + PE insole enhances comfort. The upper of this mid-cut backpacking boot uses a durable 2.8 mm full grain waxed Tuscan leather. It is treated with Hydrobloc and is lined with a Gore-Tex Performance Comfort laminate. This construction makes the 1025 Tofane NW GT RR waterproof, breathable and moderately insulated. The leather hiking boot has a rubber rand at the toe area which enhances its durability and protects the foot against knocks. Comfort is amplified by its padded tongue and collar. The Zamberlan Flex-STM (ZFS), a flex junction in the ankle area, increases flexibility. Lastly, its lacing hardware features metal D-rings and open and closed hooks for fit management.